Capital S.M.A.R.T is now operating at Northgate in Brisbane, about nine kilometres from the CBD. Capital S.M.A.R.T Repairs Chief Operating Officer and Director, Jim Vais, said it was the second centre in Brisbane and would complement the centre at Murarrie and provide better service for customers in Queensland. "Capital S.M.A.R.T aims to provide exceptional customer service from the first day of operation of every new facility and we were able to do that at Northgate by leveraging the expertise of the established team at our Murarrie centre," Mr Vais said. 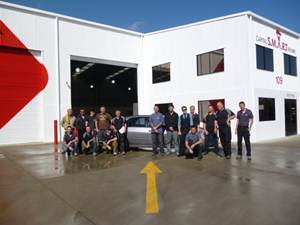 "Our people at Murarrie provided the training in S.M.A.R.T's collision repair processes for the new Northgate team members in the weeks leading up the opening."